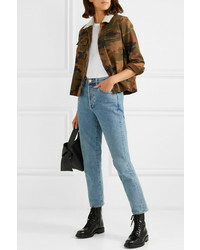 If you're obsessed with practicality dressing when it comes to fashion, you'll love this chic pairing of a Madewell northward faux med camouflage print cotton twill jacket and light blue ripped boyfriend jeans. Rock a pair of grey leather ballerina shoes to instantly up the chic factor of any outfit. We're all seeking comfort when it comes to dressing up, and this combination of a Madewell northward faux med camouflage print cotton twill jacket and black shorts is a vivid example of that. 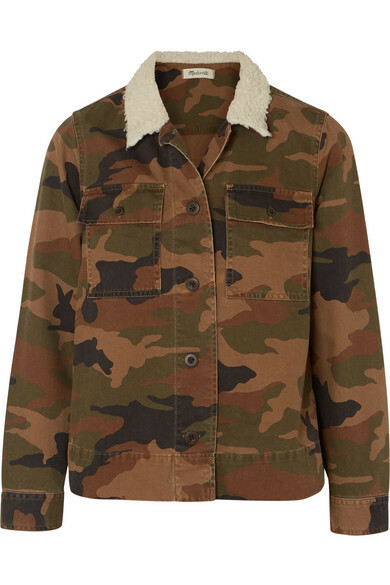 If you're all about functionality dressing when it comes to your personal style, you'll love this absolutely stylish pairing of a Madewell northward faux med camouflage print cotton twill jacket and navy skinny jeans. Let's make a bit more effort now and make black suede pumps your footwear choice. We're all looking for comfort when it comes to dressing up, and this combination of an olive camouflage military jacket and a black leather mini skirt is a great illustration of that. Up the ante of your getup with beige leather pumps. If you're obsessed with comfort dressing when it comes to your personal style, you'll love this seriously chic pairing of an olive camouflage military jacket and blue ripped skinny jeans. Kick up the cool of your outfit by completing it with beige suede pumps. 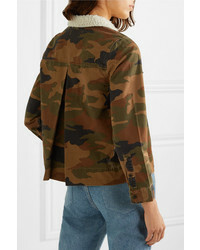 If you're obsessed with relaxed dressing when it comes to your personal style, you'll love this incredibly chic pairing of a Madewell northward faux med camouflage print cotton twill jacket from NET-A-PORTER.COM and a black leather mini skirt. 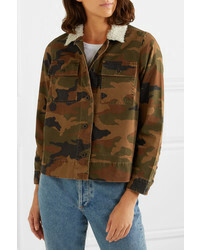 Marry a Madewell northward faux med camouflage print cotton twill jacket from NET-A-PORTER.COM with a black skater skirt if you're searching for an outfit idea for when you want to look casually cool. If you're all about being comfortable when it comes to figuring out an outfit, this combination of a Madewell northward faux med camouflage print cotton twill jacket and black leggings is totally you. Dress up this getup with red suede pumps. If you're obsessed with comfort dressing when it comes to your personal style, you'll love this chic pairing of a Madewell northward faux med camouflage print cotton twill jacket and black skinny jeans. Round off with tan suede lace-up flat boots and off you go looking stunning.